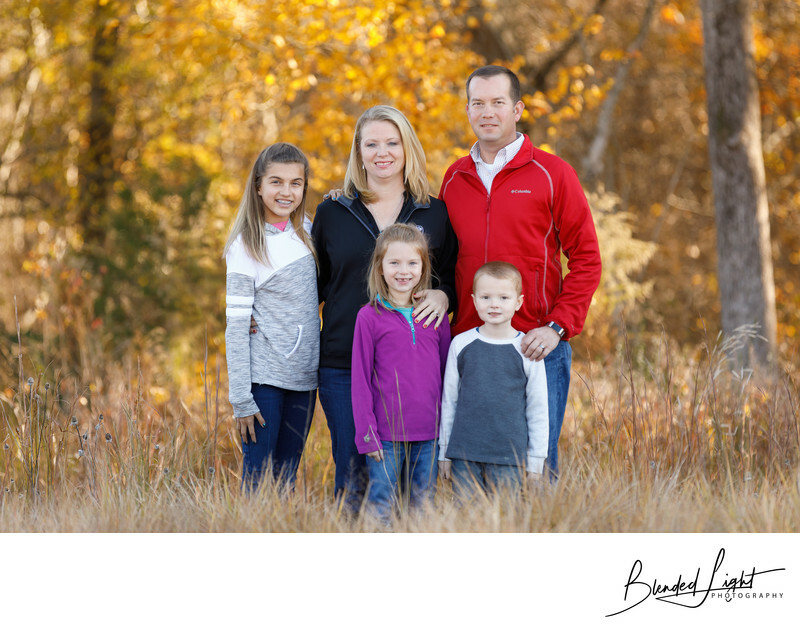 Fall makes for a wonderful time of year to get outside, find a beautiful location and create your family images. Any time I have the chance to place clients in a spot that brings in multiple natural elements, it's a done deal. The only one missing here is water, which is actually about 100 yards away. With the family wearing darker colors, they made a nice offset with the colorful tress and leaves in the background. Just behind them and out of frame, there is one of the many walking trails that dot the Wake Forest and Raleigh area. For this shot, I actually stood in the ditch and shot up to the group. By being lower than they were, I was able to get the leaves in the foreground as well as the tree leaves in the background. Had I done this shot on the same level, the background would have been tree trunks and the asphalt driveway with an empty farm field, so the change in my position relative to the the group completely changed the perspective. Additionally, with this shot being in the shade, I used a off camera flash, shot through an umbrella, to create some really soft light on the family. One click with everyone looking and we had a great family picture just in time for Christmas. 1/320; f/3.5; ISO 400; 200.0 mm.